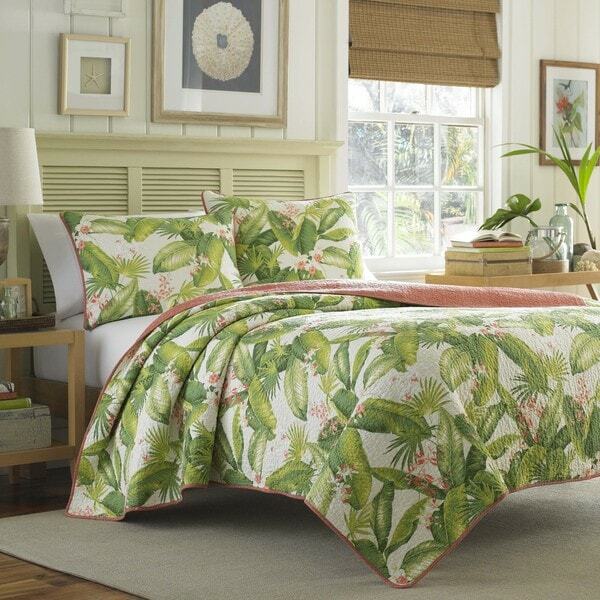 Relax and unwind with this tropical-themed quilt set by Tommy Bahama. 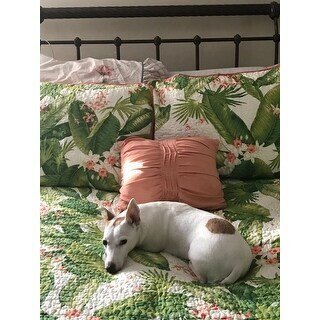 Made of 100-percent cotton with a medium weight fill, this quilt showcases a vintage-inspired tropical leaf print in green and white on one side with a solid coral color on the reverse. This is a beautiful quilt. The stitching gives a lot of subtle texture and the colors are gorgeous. The "coral" looked pink on my computer screen, which was a concern, but it is definitely an orange coral which is exactly what I wanted ( I got the Ecru color). The pillow shams are not reversible which is a shame, but other than that I couldn't be happier. This is a quality quilt and well worth the money! This is a great-quality cotton quilt that washes beautifully. 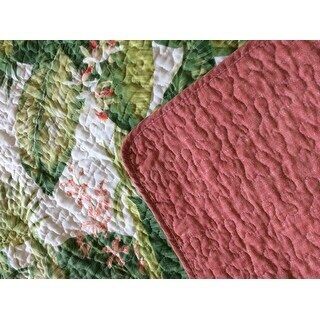 The reverse side of the quilt is more of a terra cotta than a coral. I ordered Damask Stripe Cotton 500 Thread Count Sheet Set, Item #18403373 in Lime and Hemstitch 400 Thread Count Cotton Sateen Weave Solid Color Sheet Set, Item #11402894, in Coral. Both look great with this beautiful, vibrant quilt. Love this quilt! I reordered one more. Nice weight and I love the colors. This is exactly what I have been looking for and the quality, material, etc is marvelous. The only thing missing is the opportunity to buy more pillow shams. Got a large twin size so only one pillow sham. The coral trim really adds to the green leaf design. After two years of searching I am so please. Exactly what I was looking for! A great light weight quilt! I live at the beach and wanted something I could use in place of a bulky, heavy comforter which gives me the color I want, but would be entirely too heavy to sleep under. This beautiful quilt adds the colors of a comforter without having to be removed each night in order to sleep comfortably. Excellent quality for the price. The colors are just as they appear in the listing. I love it! This quilt is beautiful! I bought a kingsize to cover my queensize bed and it worked out well. For the first time in a long time I actually make my bed everyday so I can enjoy the look of it. I love my new quilt from Tommy Bahama! The colors are nice and bright, very true to the picture given. The quilt is made very well and looks like it will hold up well in the laundry. 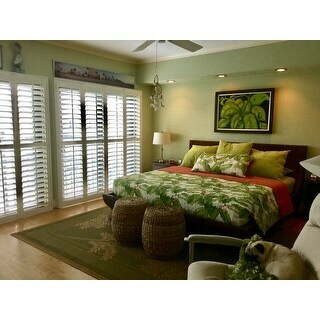 My guest room looks so inviting and tropical now! I just love it! I do wish it came with a bed skirt. I would recommend this quilt and Overstock to my friends and family! Comes with two king shams but I was hoping for standard as the other Tommy Bahama came with standard shams. Beautiful colors and quality. Really pops. We have a large master bedroom, that had all white walls w/ high white ceilings. It needed color fast. We painted one wall that was around the slider a tropical green and also above the slider that had a deep accent shelf. We purchased custom cellular blinds w/the same green, we swgged one of the St.Croix panels ( below) on each side of the small Windows that flank each side of the bed..Placed the other set on the slider.With new faux wood vertical blinds . 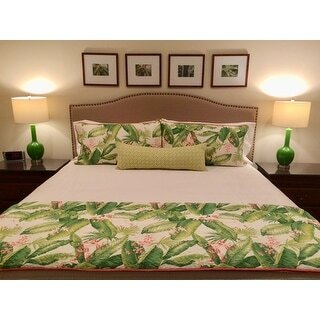 The Tommy Bahama bedset helped pull together our new Tropical theme. But we didn't stop there, The ROSE TREE PILLOWS And the Gerber Time IV Canvas all pulled the room together, with one stop shopping at Overstock. JUST LOVE DECORATING AT "O" .Moving back to Kansas in a few weeks, and making my wish list!! I'm so happy I choose this set! 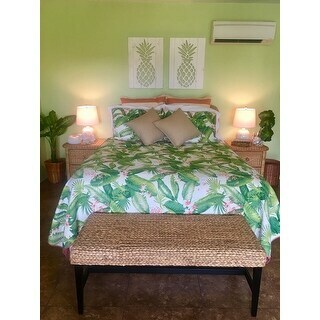 I have a guest room I am doing in a refreshing bungalow theme. I was looking for something that both adults and kids would like...this set is perfect!! The rust color on the backside is more pleasing than the picture shows. The Tommy Bahama classic palm theme has a rich look and feel to it. The look matches its quality of the product. It's a lighter weight for a quilt which I really like with Summer coming. The new Guest Room looks like a cozy get-away! LOVE IT!! Absolutely love this set! Looks even better in person! Beautiful colorful quilt , just the right weight for Florida, only complaint is the size, wish the king size was a little bigger. other than that it is very tropical. Gorgeous set! Very tropical and bright! Love it!!!! A little thinner than anticipated but will just add a light blanket. This quilt was all I expected it to be! The quality is there. The colors as shown. It's of a generous size. My only challenge is with the pillow covers - they don't overlap enough on the back side - not as neat looking as they could be. Maybe some velcro to hold it together?? Service from *** as awesome as I've come to expect. Thank you! Absolutely great! Colors are vibrant and as shown in the picture. Would definitely recommend. Loved it. Colors vivid. Good quality materials. Love this pattern, especially the contrast color. I always make sure the top of the quiilt is turned down to get that contrast. Have not washed it yet but it seems durable. Second purchase because the first one was so great. Nice except the shams were a bit lighter weight than I like. The collars a vibrant and the quilt is a very nice weight for our beach condo. Just what I was looking for in a set! This spread gave my bedroom a tropical feel. Nice colors and quality material. Would recommend. Price was great. Much less money than I had seen in name brand stores. Love this quilt set. Full size quilt for the king bed we have. Washes beautifully. No shrinkage. Colors stay true after repeated washings. My favorite! Play in record time and I was out with the quality! The colors were more beautiful and vibrant than I thought! It totally was the perfect addition to my redecoration project! Love it! "I am very happy with this set set but am having a very hard time finding a bed skirt/dust ruffle to coordinate with these colors. I am using them on twin beds in my guest room, so a 14-15" drop is required. Any suggestions would be appreciated." "Hello is the background cream color or a pure white thanks"
The background is more creamy than stark white. To me it gives a more relaxed overall effect. We have been very happy with our purchase. I would say it's more of a light cream. Not bright white. There doesn't seem to be enough of the white to make a big impact. It is a beautiful quilt! I did have to get a king size for my queen size bed so it would fit like a bedspread. The background is a bright, light cream. The bedskirt that I have with the quilt is white and a definite contrast to the cream--but a favorable one. Very pretty, unique queen quilt set. "I want this to go to the floor. Is it just a coverlet? Also, do you have it in king size, as the extra width might work. And do you have short curtains in green, not vivid, that would match? Thank you." Yes,this is a quilt. If you wanted to go to the floor you might want to order a bigger size than your bed. Unfortunately we don't have the perfect matching curtains for this. Tommy Bahama also makes a coverlet in this same pattern, which they call a "throw", so make sure when you order, that you are ordering the quilt and not a throw. The queen comes way down over the side on my queen bed, so a king should go to the floor if your bed isn't too high. "Can anyone please tell me the difference between the dimensions of a Kingsize and a Full-Queen. I am in the UK and believe our sizings are different. Just checking before I place an order for the wrong size. Many thanks." The measurements are as follows: Full/queen: 90 inches wide x 90 inches long and King: 96 inches wide x 104 inches long. "How much for a queen size quilt..,and price for king size shams?" We do offer item#17344374 in queen and king. Please add the items to your cart to see the price. I hope this helps. "I purchased the aregada dock ecru quilt and I Would like some additional pillow shams that would go with. European size Thank you"
"Is it orange or pink? It's hard to tell from the pictures. What is the reverse side?" Hello gfllady, this is more of a Peach color. Please let us know if you have any further questions.